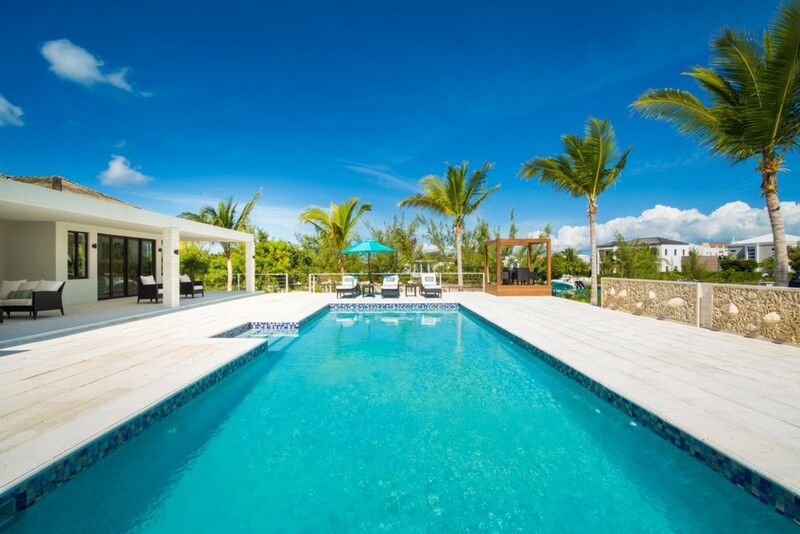 Nestled along the serene Canal front in Leeward is the luxurious 6-bedroom White Coral Villa. 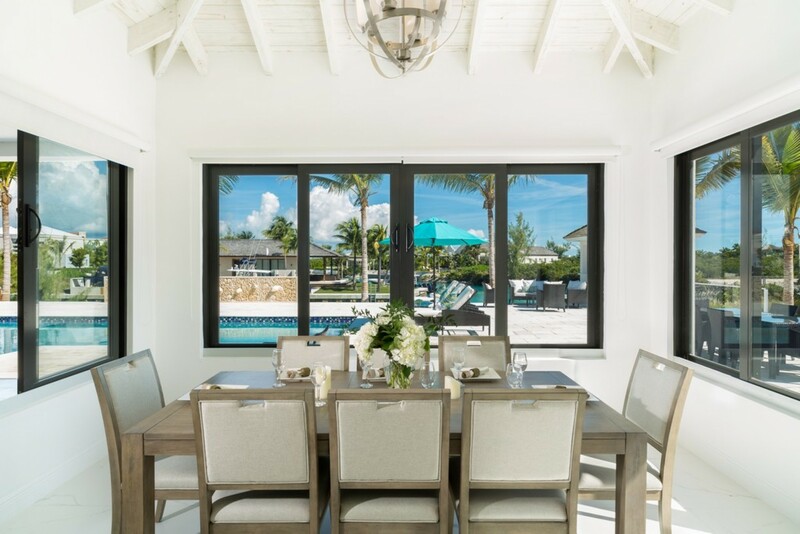 This quiet location provides you and your loved ones with an authentic Caribbean experience as well as being based close the world-famous Grace Bay Beach this island has to offer. 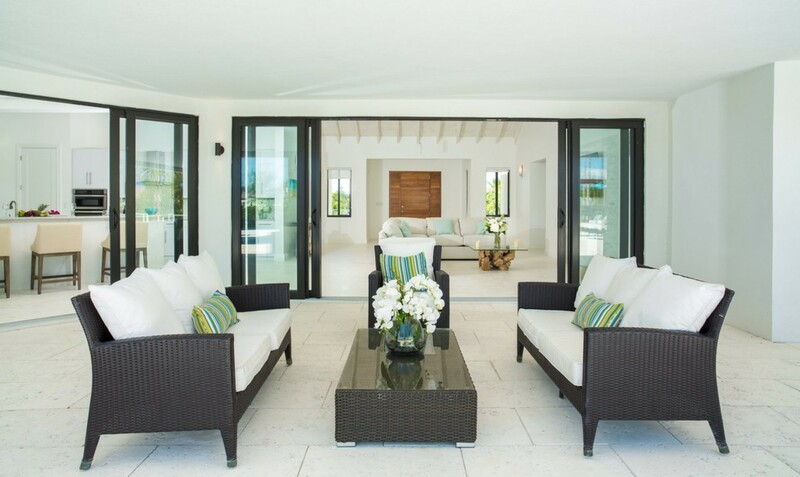 The villa can accommodate up to twelve guests over its expansive interior and exterior living spaces. 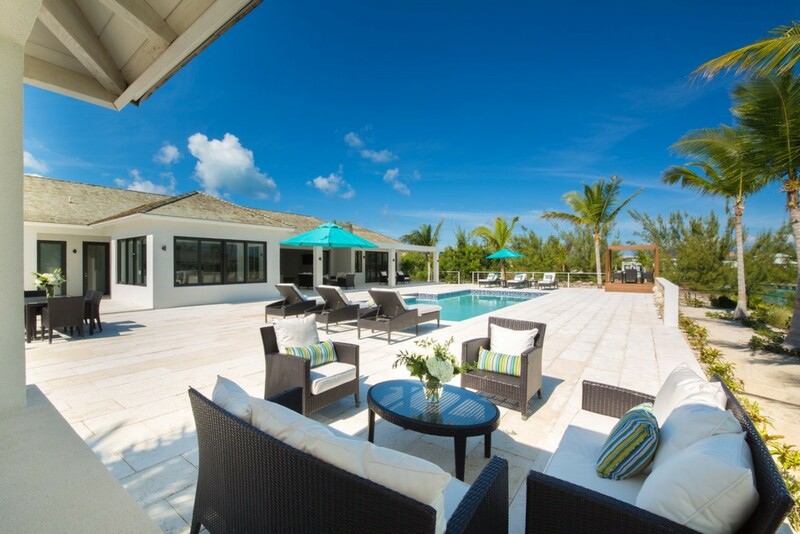 The Villa consists of the main house and an additional guesthouse. 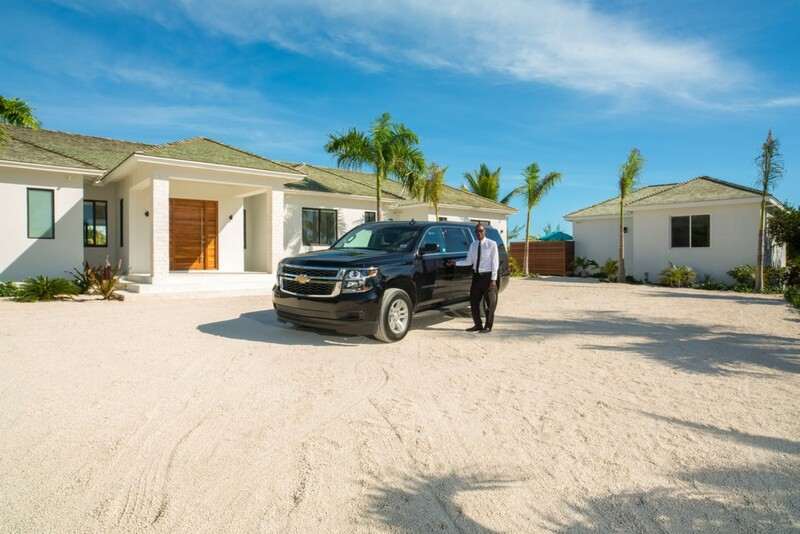 The staff at White Coral Villa offer you and your guests a 5-star luxury service, geared at protecting and enhancing your stay here in the beautiful Turks and Caicos Islands. 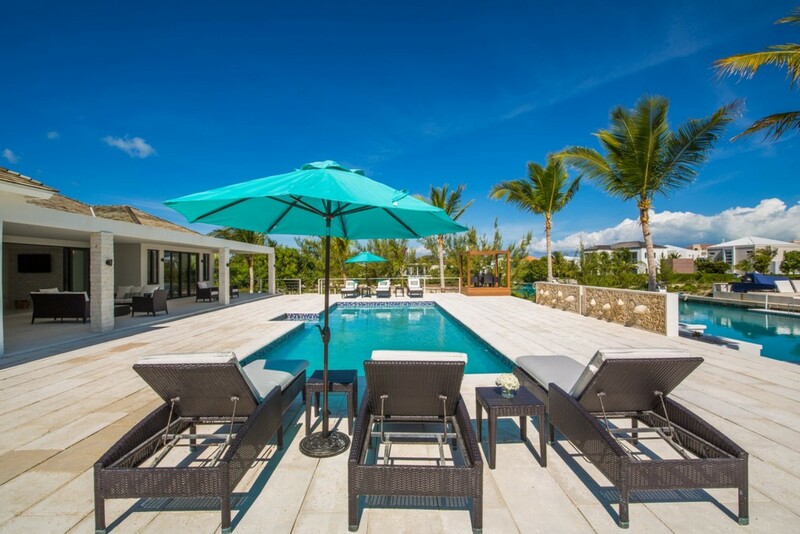 Tending to each and every one of your needs, the villa maintains a high standard providing the ultimate Caribbean vacation experience. 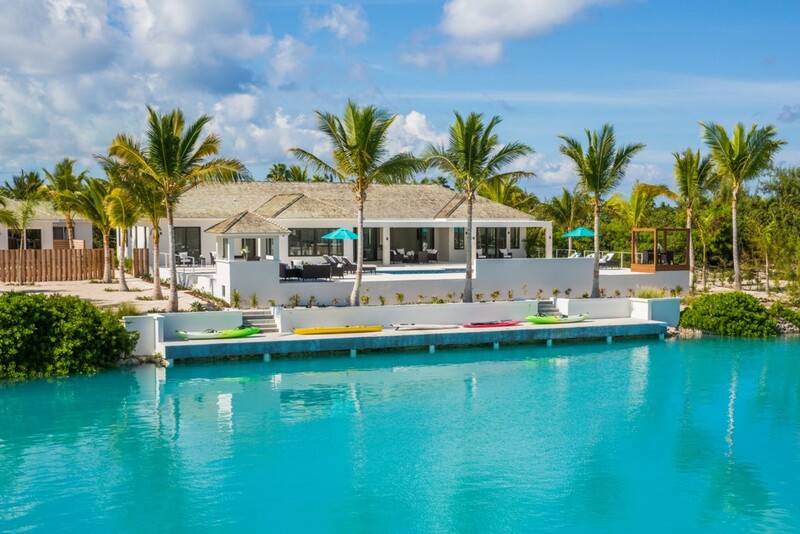 Turks and Caicos provide a unique vacation experience, with its warm climate, and world-famous beaches. 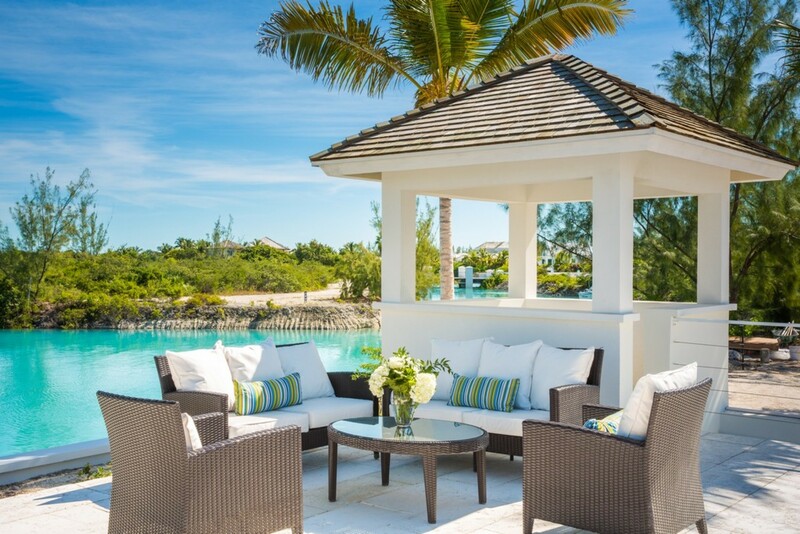 Beaches such as Grace Bay beach and Long Bay are a short drive away, so spending a day on these lavish shores comes easy. With sugar fine white sands and mild turquoise waters, these beaches feature a large variety of adventurous underwater activities. The crisp crystals waters that are lined in reefs are mystical and a delight to swim in. The incredible Smiths reef is a key location for some of the best snorkeling. 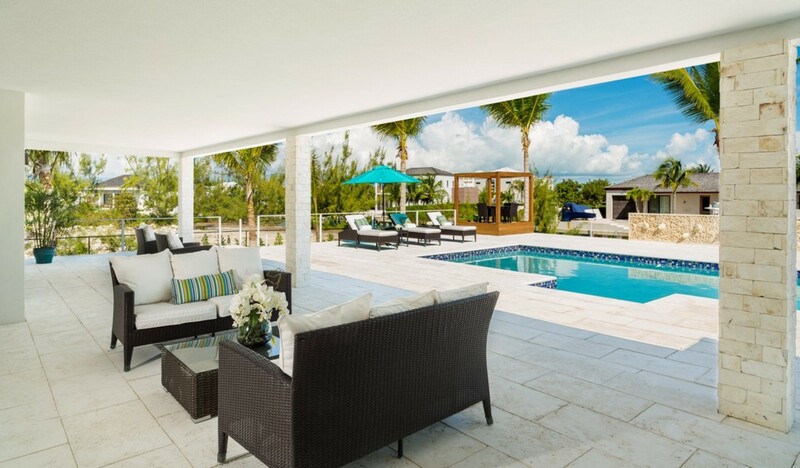 It is based alongside Grace Bay, a 3-mile beach with safe shallow, clear blue waters. These locations are well-preserved for the bright coral reefs. 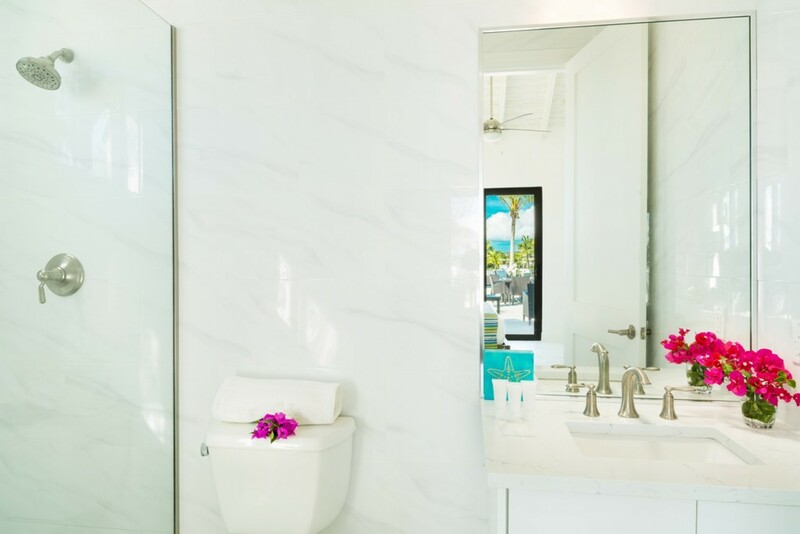 Nestled in a profusion of vivacious plants and tropical vegetation, White Coral Villa indulges in both Canal and Sea views towards the horizon. 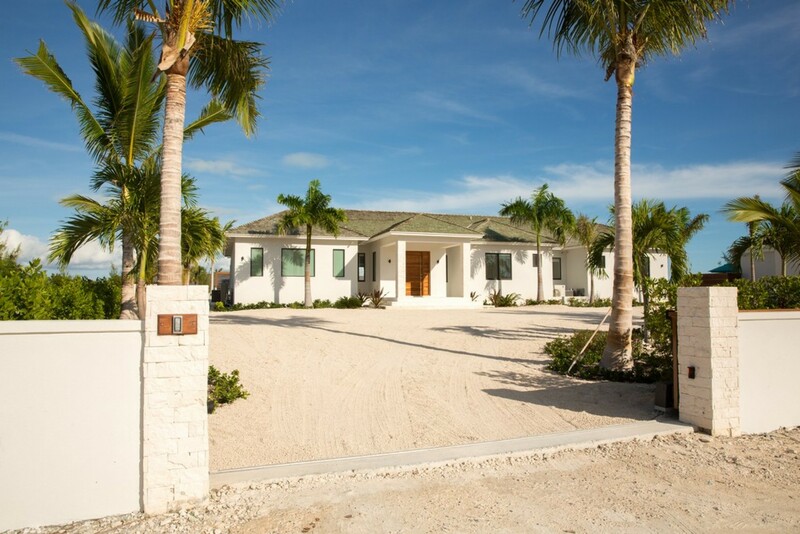 Driving into the property you will be greeted by the tall swaying palms and the caramelized wooden doorway of the house. 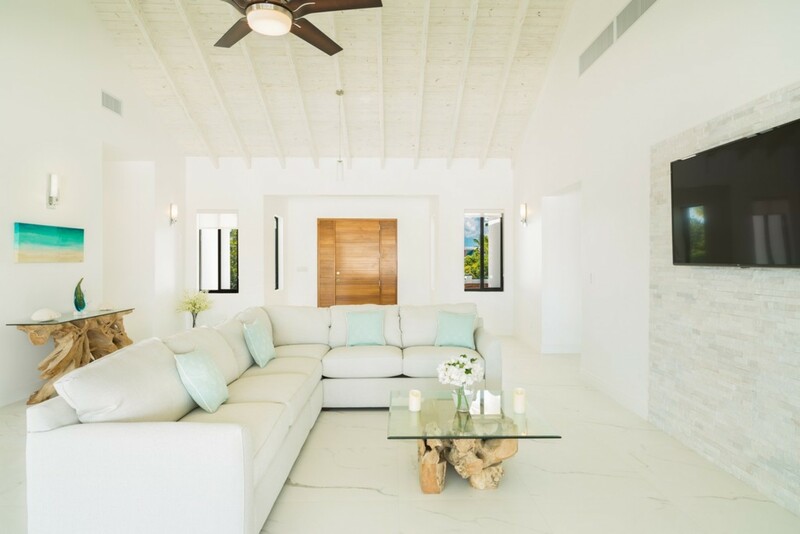 The architecture indulges in a classic Caribbean styles design, with whitewashed walls and a simplistic one-story plan. 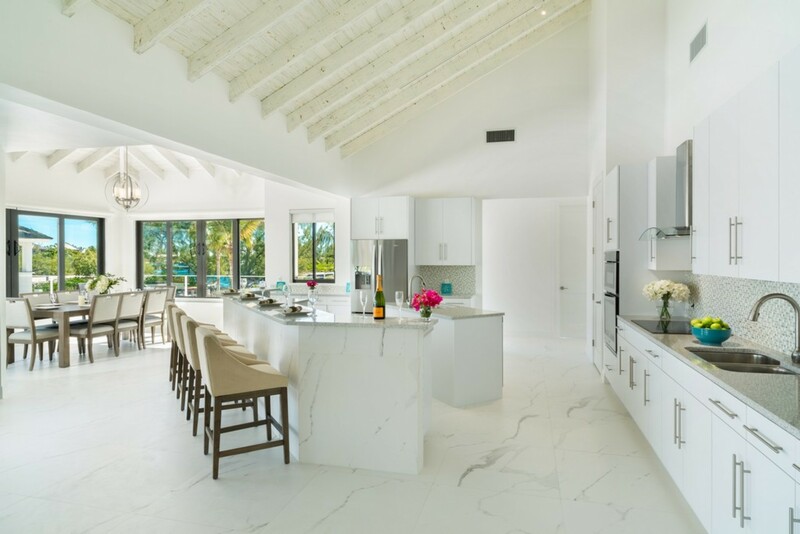 The main entrance leads you directly into the main living area which blends the dining, living and kitchen areas into one open space. The room indulges in incredible views of the terrace, pool, and canal due to the ceiling to floor windows and fold back doors. 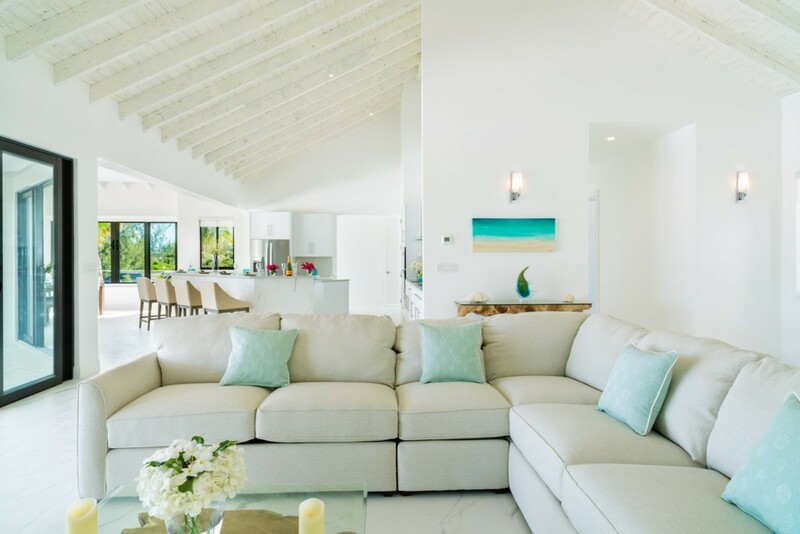 The high vaulted ceilings create an airy and refreshing interior space, with the white walls bouncing light around the room. The living area is fitted with a large L shaped sofa and clear-cut glass coffee table. 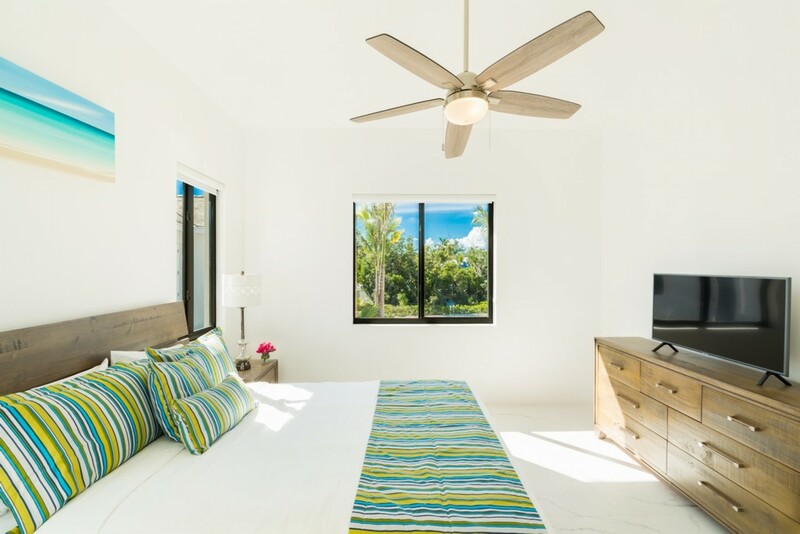 There is a high-resolution TV mounted on the wall opposite, and the ceiling fan overhead assures a comfortable temperature as you relax here. Making your way over to the dining area, the smooth wooden table seats eight of your guests comfortably, soaking in the 360-degree views. 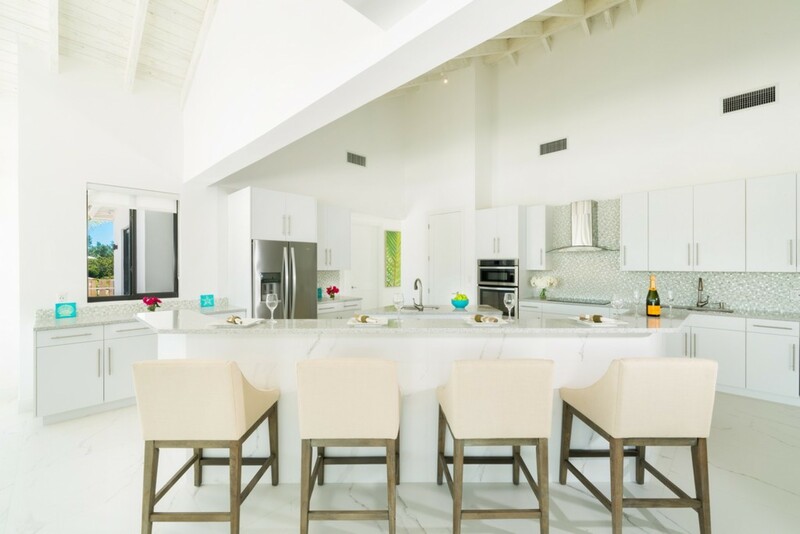 The kitchen comes fully equipped and ready to use during your stay. 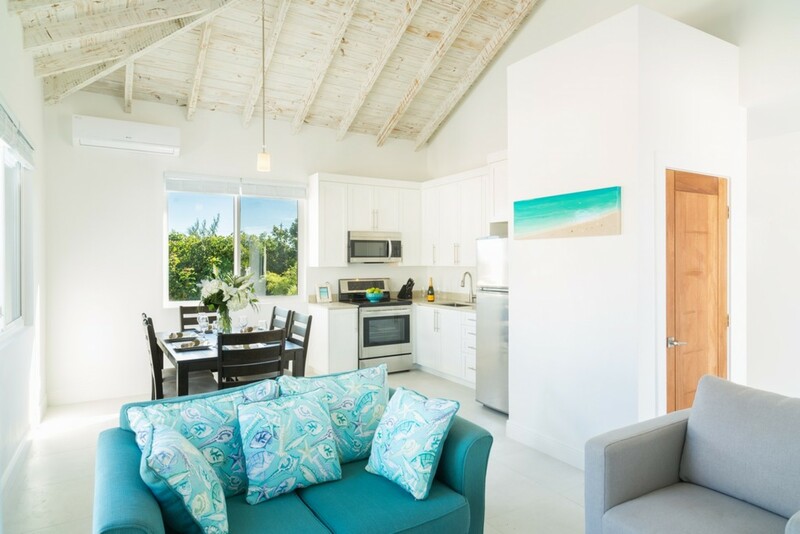 Appliances include the large Breakfast bar seating four guests, an electric stove and oven, a coffee machine, a dishwasher, and a blender. 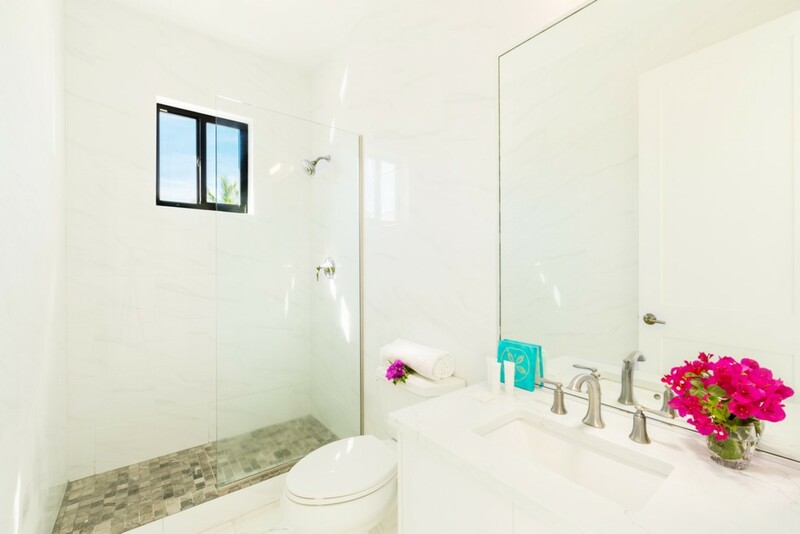 The area is exquisitely designed with pristine white marble countertops and white glossy cabinetry. 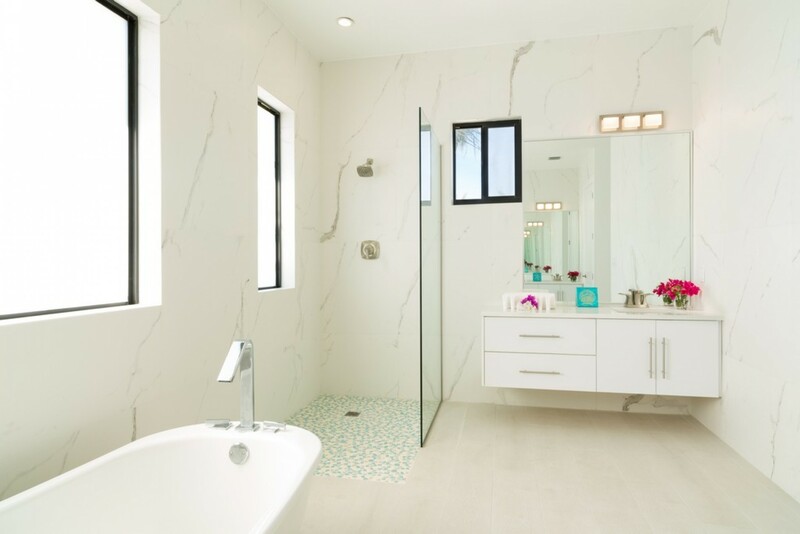 The pastel tiled wall adds texture and a hint of cool tones into the space. 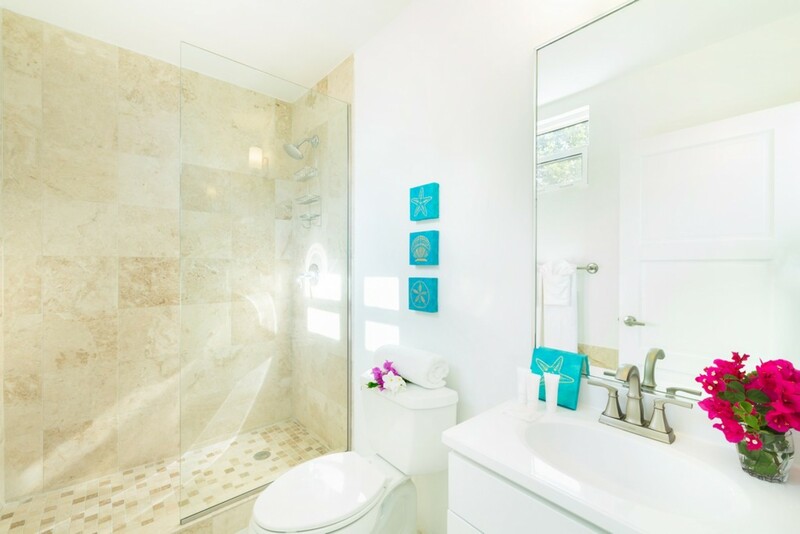 The interiors feature an iHome docking station, cable TV and secure Wi-Fi. 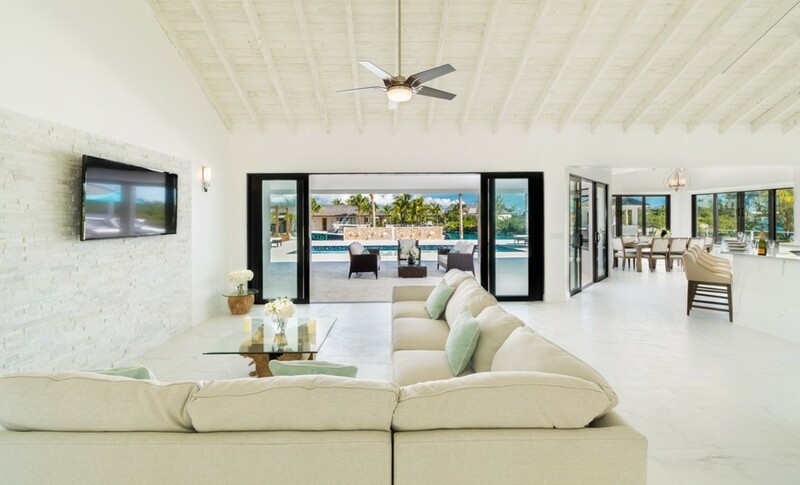 The villa includes an expansive terrace that extends the length of the villa. 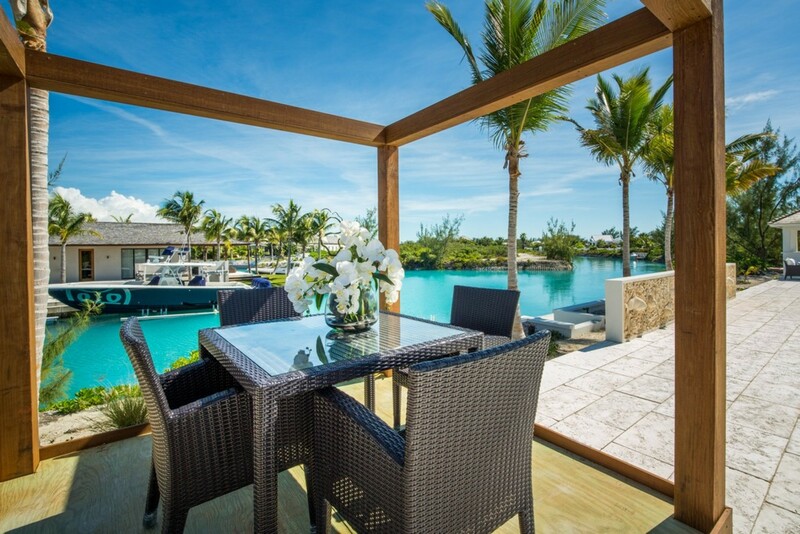 Overlooking the Canal, it is the perfect spot to watch the sunrise in the mornings. Perch on the covered lounge area as you wake up to this tropical scene. 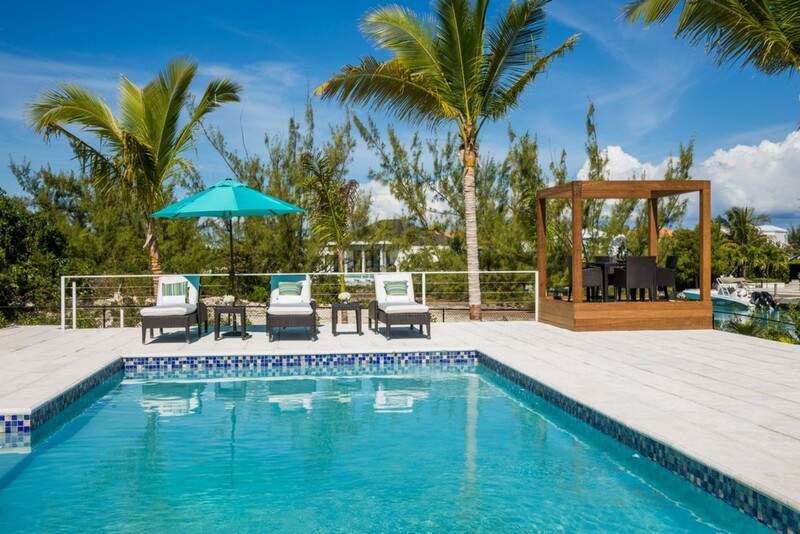 Slip into the swimming pool for a refreshing swim and dry off on the comfortable sun loungers. 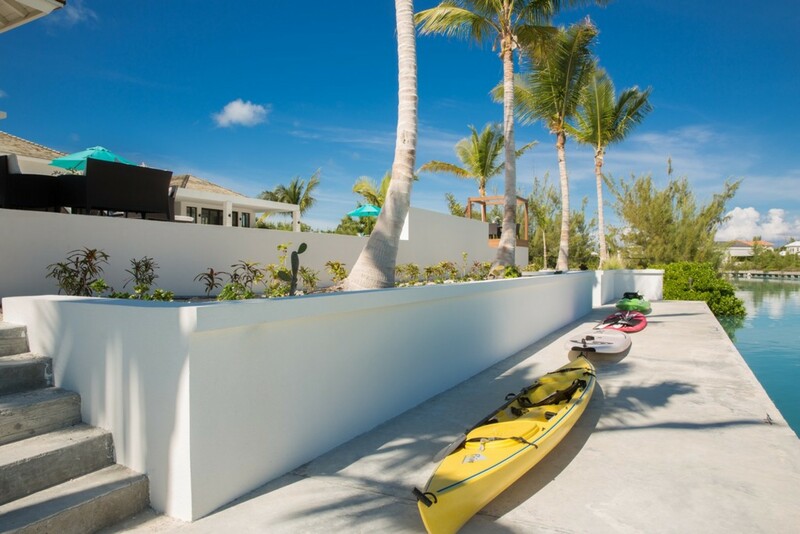 The private pier at the front of the villa is where you will find some of the villa watersports equipment including kayaks and paddle boards. Explore the waters or delve under the glistening surface into the crystal-clear waters for another swim as the days get hotter. 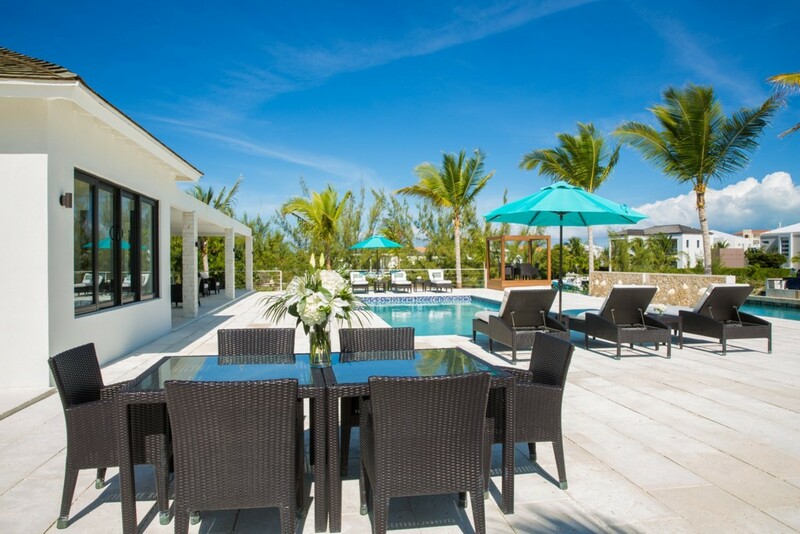 In the evenings you can embrace the island style living as you dine alfresco under the stars. 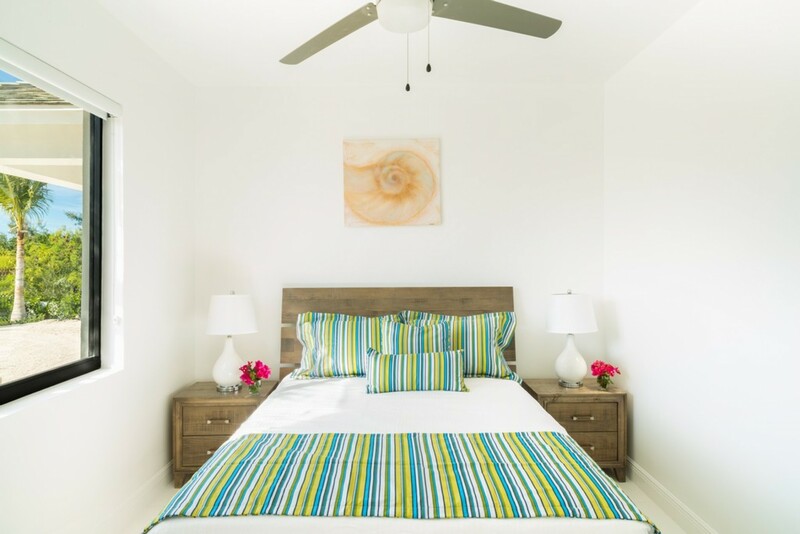 Let the warm trade winds skim across your skin and the sounds of the waterfront lull you to sleep each night. 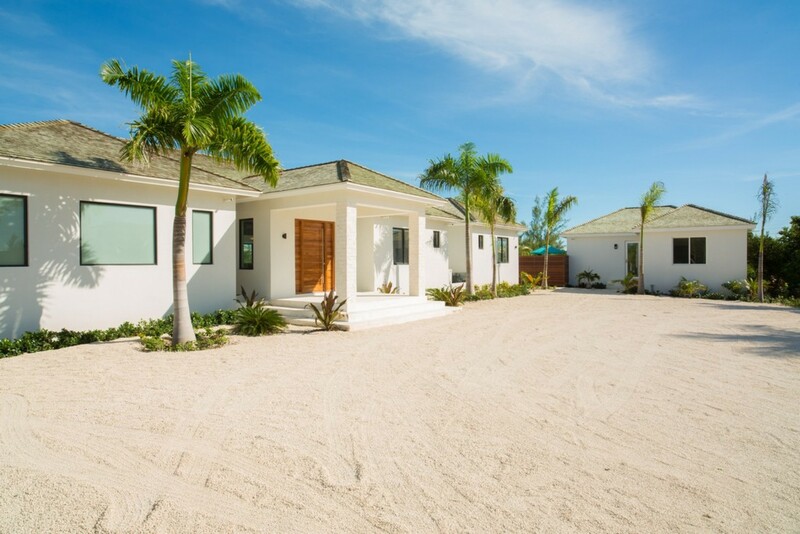 The villa encompasses a total of 6 bedrooms. 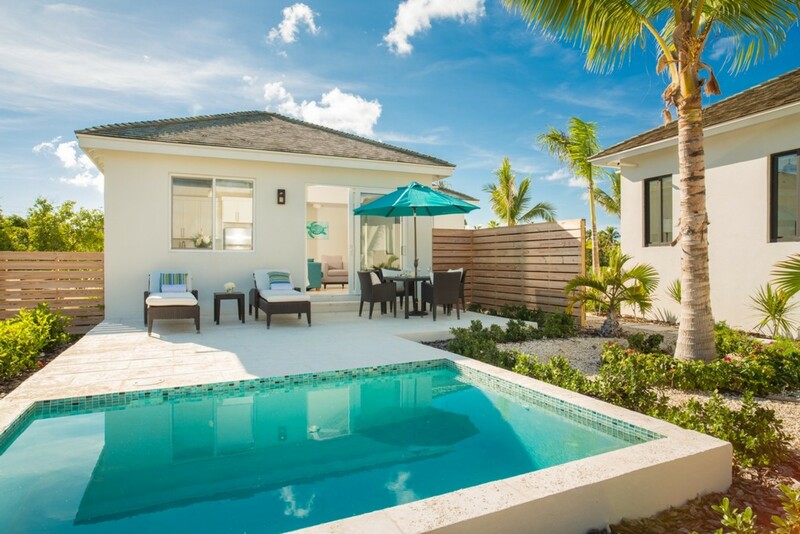 There are four bedrooms in the main house at White Coral villa and two bedrooms in the guest house, each with their own private en-suite bathroom fitted with Rainfall showers. 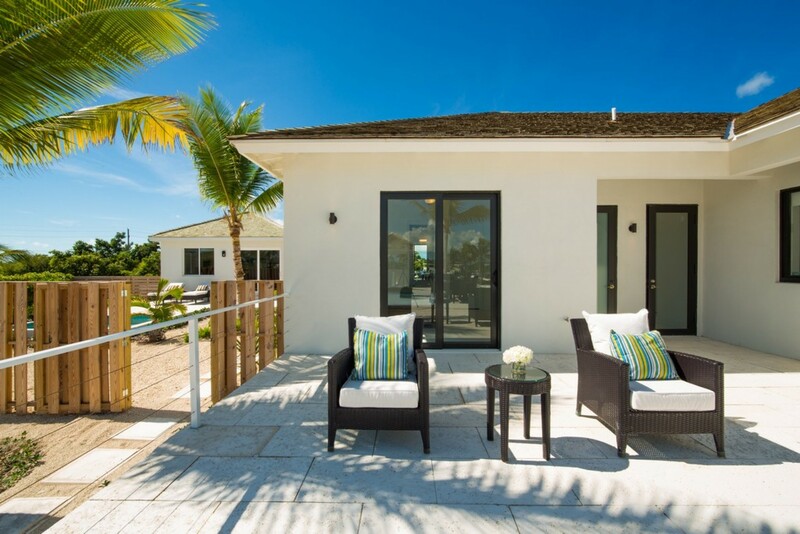 All the bedrooms are fitted with ceiling fans, high-resolution Televisions, and secure safes. 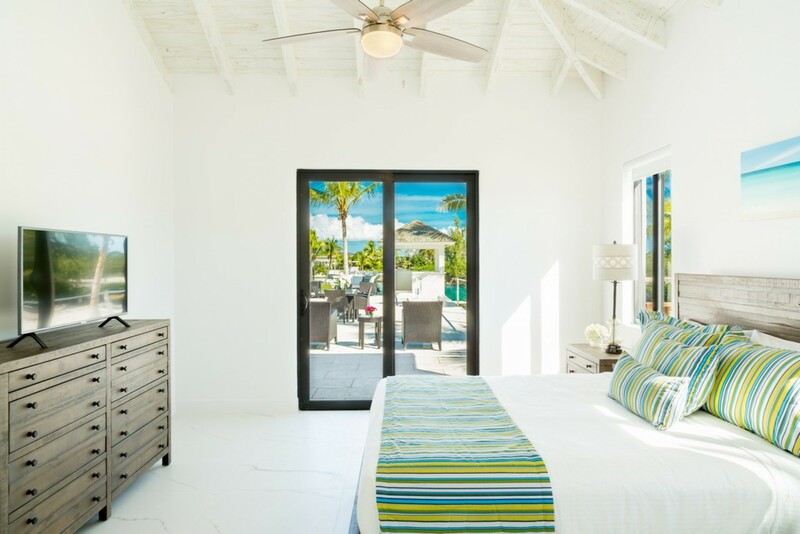 The master suite features a luxurious King-sized bed, and has direct access to the terrace, with incredible views. The room includes a large walk-in closet. The remaining three bedrooms feature Queen-sized beds. 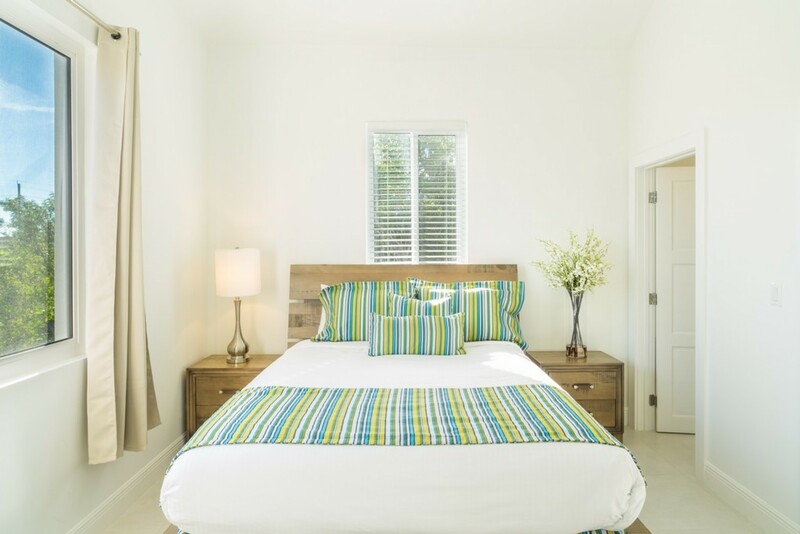 The Guesthouse bedrooms offer Queen-sized beds and have access out onto an additional terrace at the back of the property. 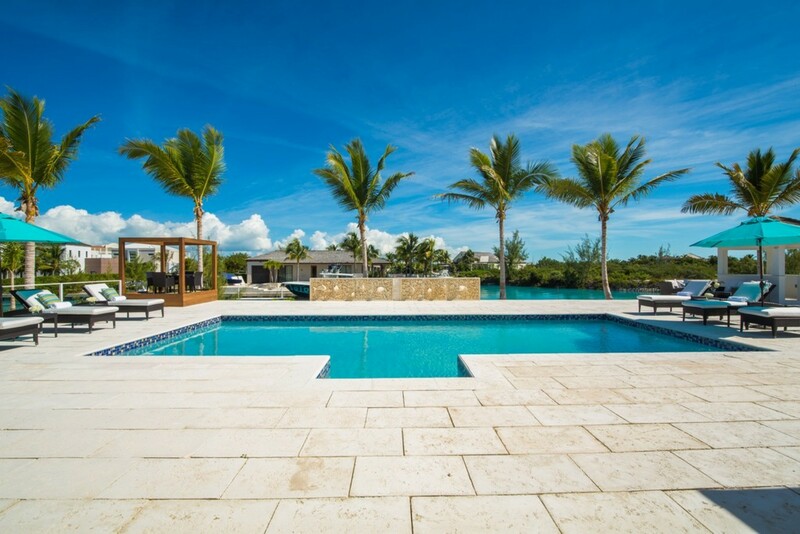 Here there is a small private pool and comfortable outdoor loungers. 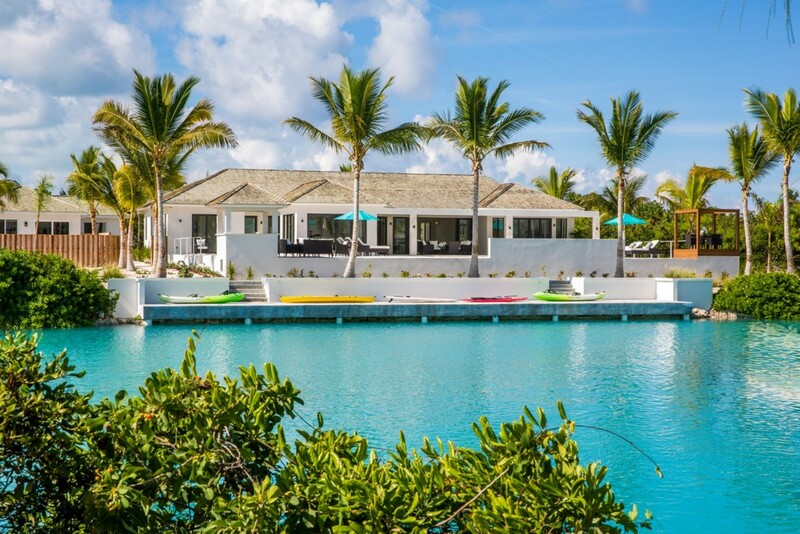 Ideally located in the quiet and secluded Leeward, this private canal front retreat is the perfect antidote to the mundane stresses of life. 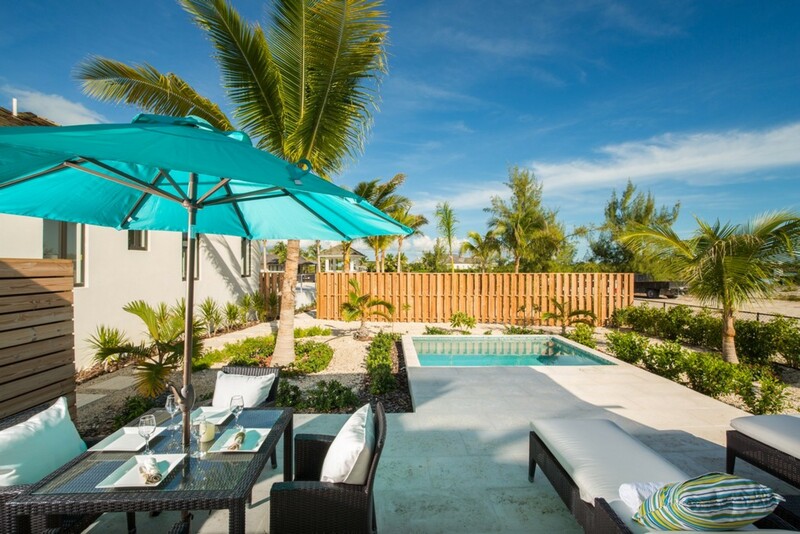 Unwind here as you realign your energy in this tropical paradise. 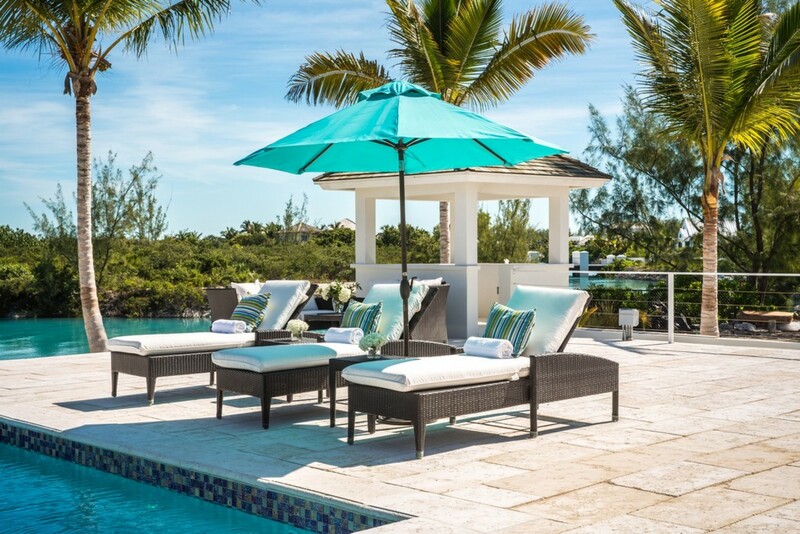 Discover an oasis of luxury and style in the Turks and Caicos Islands at the White Coral villa. 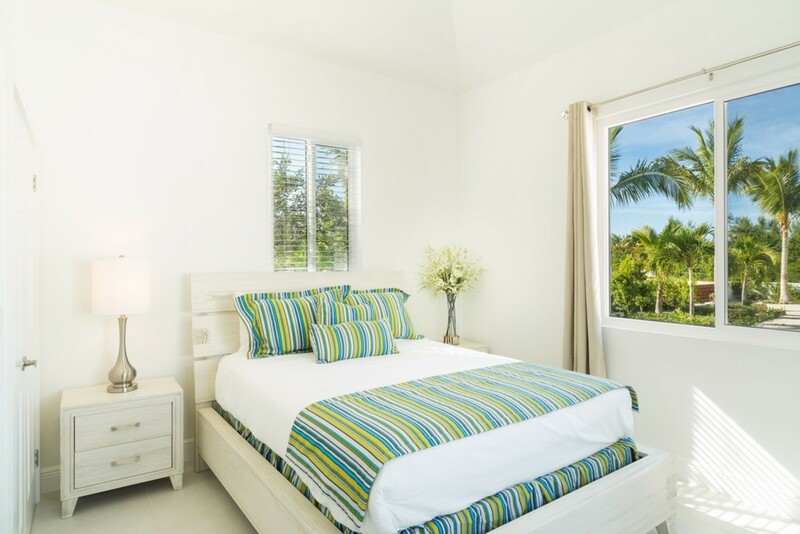 Bedroom 1 Master: Luxurious King-sized Bed, Private en-suite bathroom, Standalone Rainfall Shower, Dual vanity, Large Walk-in closet, Ceiling fan, Direct access onto the terrace, Covered outdoor seating area, Incredible Sea Views. 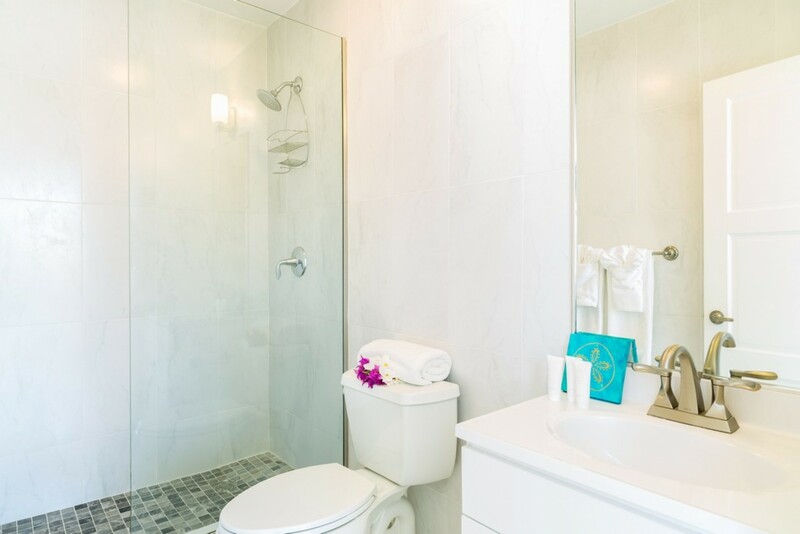 Bedroom 2: Large Queen-sized bed, Private en-suite bathroom, Standalone Rainfall Shower, Vanity, High-resolution Television, Ceiling fan, Air-conditioning. Bedroom 3: Large Queen-sized bed, Private en-suite bathroom, Standalone Rainfall Shower, Vanity, High-resolution Television, Ceiling fan, Air-conditioning. 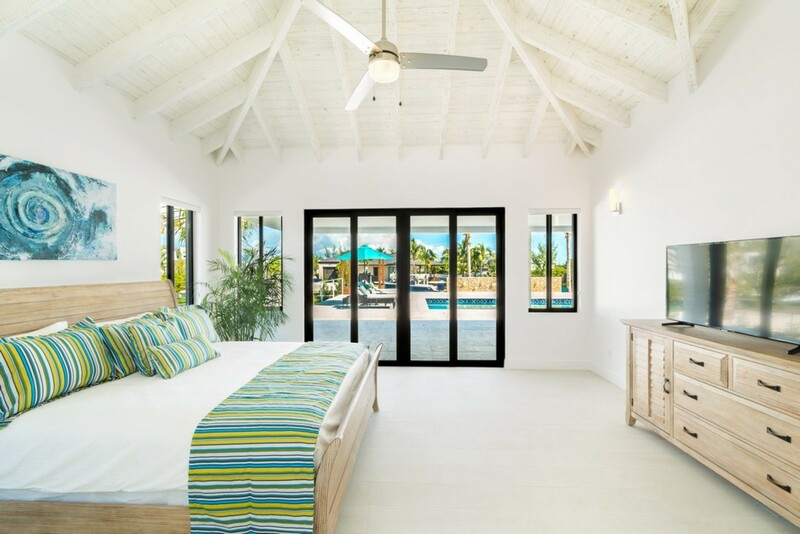 Bedroom 4: Large Queen-sized bed, Private en-suite bathroom, Standalone Rainfall Shower, Vanity, High-resolution Television, Ceiling fan, Air-conditioning. Bedroom 5: Large Queen-sized bed, Private en-suite bathroom, Standalone Rainfall Shower, Vanity, High-resolution Television, Ceiling fan, Air-conditioning. Bedroom 6: Large Queen-sized bed, Private en-suite bathroom, Standalone Rainfall Shower, Vanity, High-resolution Television, Ceiling fan, Air-conditioning. *A private Butler and professional chef service can be arranged at an extra cost. 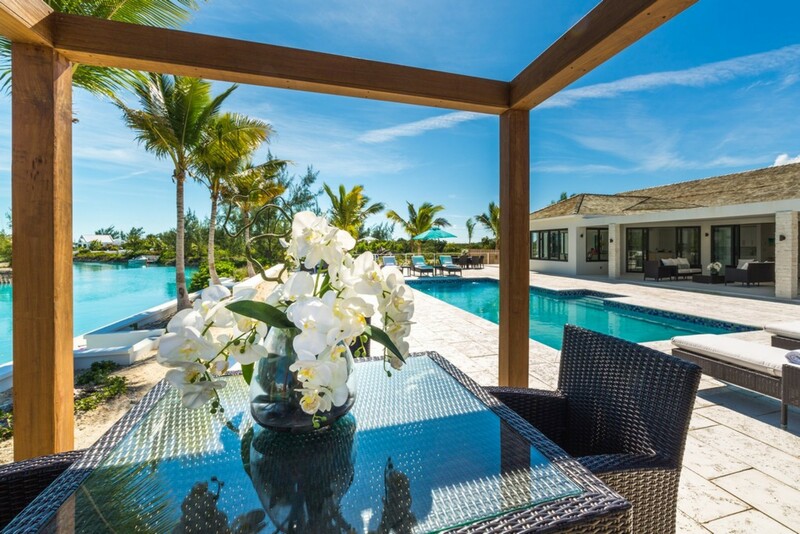 White Coral Villa is nestled along the Canal front in the tranquil area of Leeward in Turks and Caicos. 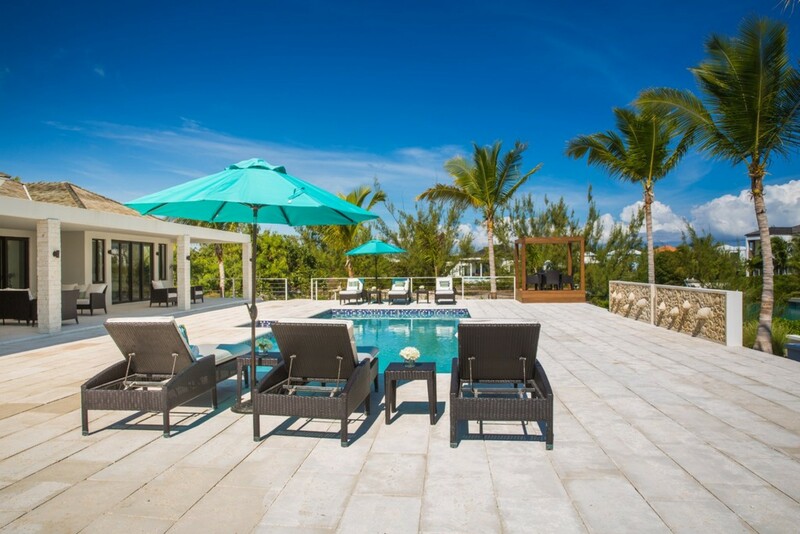 The villa is located along the Canal front in a quiet area and is also based a short distance from Providenciales and some of the world-famous beaches these islands have to offer such as Grace Bay and Long Bay Beach. 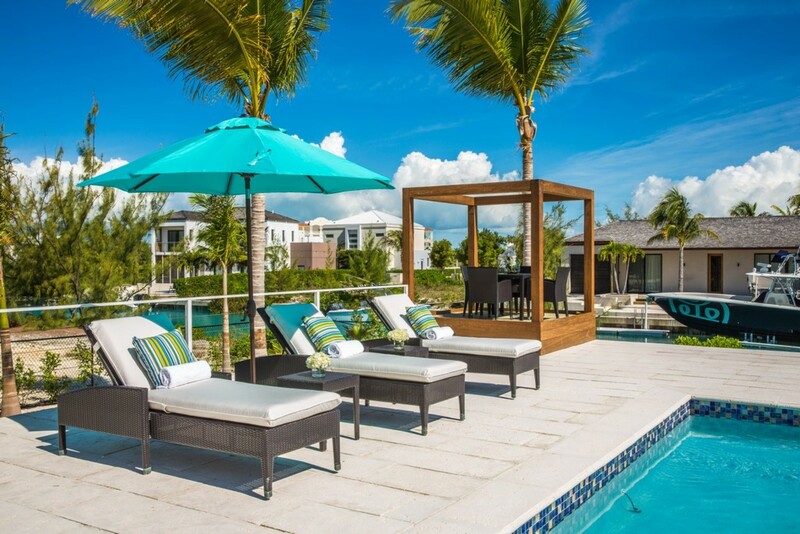 The Turks and Caicos Islands consist of 40 different islands and offers a great climate due to warm trade winds. 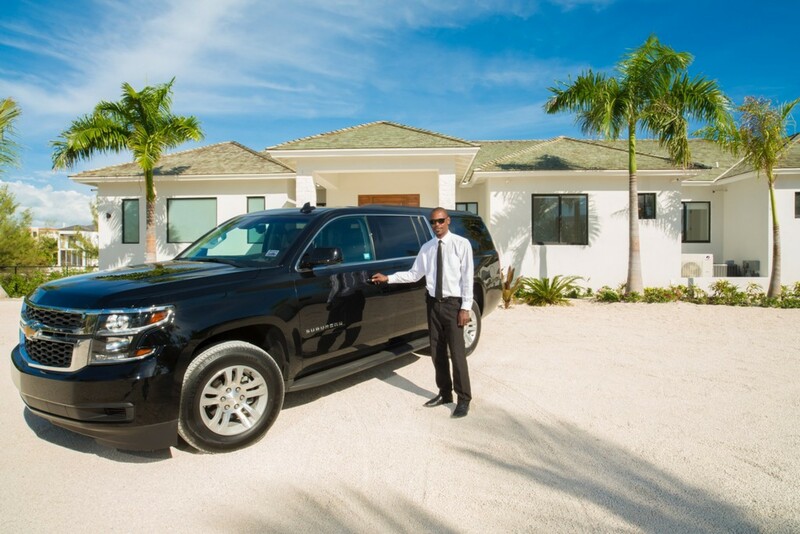 Leeward is one of the safest parts of Providenciales as it has one of the lowest crime rates.